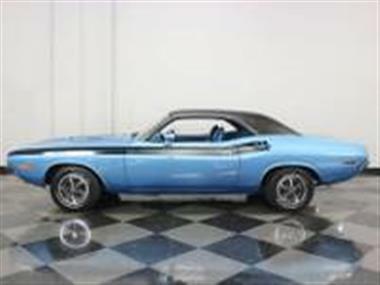 If you had a wish list of all the features youd want in your next muscle carand#44; this 1970 Dodge Challenger R/T would probably nail them all. Big block power? Loaded with options? Fresh restoration? Awesome colors? 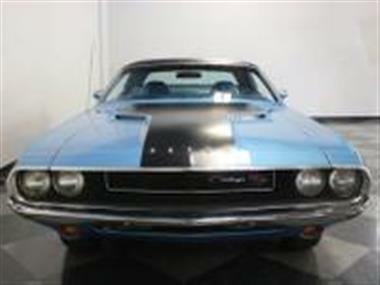 All of it is included with this fantastic blue Challenger. 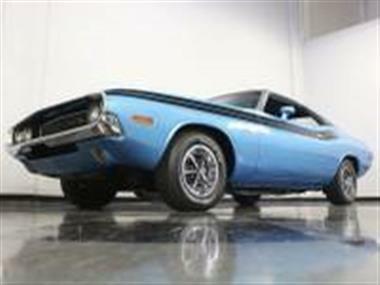 Have a look and prepare to be impressed.<br /> <br /> You may as well get a popular color on your Mopar muscleand#44; because thats one of their most defining features. This one wears a sparkling coat of B5 Bright Blueand#44; which is how it came from the factory. It was restored not too long ago and judging by the fit of the bodywork and super straight sheetmetaland#44; this was a pretty nice car to start with. Chrysler got the look exactly right with their A-body siblings and the Challenger ideally embodies the long hood/short deck profile that just screams high performance. 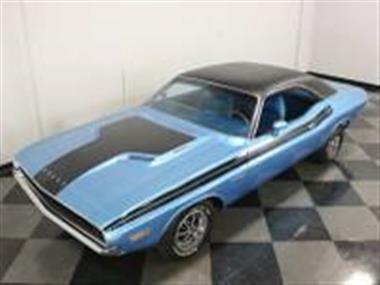 Add in a performance hood with blackout stripe and the R/T side stripes that highlight the little kick-up behind the doorand#44; and you have one of the best-looking muscle cars of all time. They kept it clean by skipping the spoilersand#44; but youre still going to have a hard time keeping a low profile in this car. The front and rear bumpers are bright chromeand#44; which sparkles against the blue paint. Proper emblemsand#44; including 383 Magnum badgesand#44; have been installed to intimidate the other guy at stop lights. 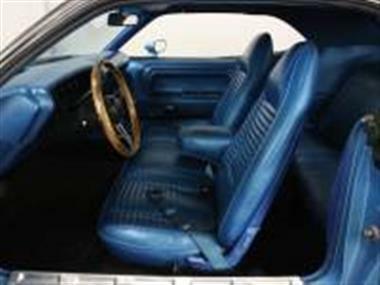 Theres also a black vinyl top (the fender tag says it was originally white)and#44; which adds a touch of formality and works rather well with the black graphics.<br /> <br /> The bright blue interior is also fully restored with rare split front bench seatand#44; a feature I bet youve never seen before. The seat covers and carpets are newand#44; the door panels are beautifully renderedand#44; and all the weather-seals look recent. The wood-rimmed steering wheel is another unusual option and finding a column shifter on a Challengerand#44; and an R/T no lessand#44; is a really rare discovery. All the gauges are fully operational and youll note that this one carries factory A/Cand#44; suggesting that perhaps the original owner wanted a touch of luxury with his performance. Its possible that the back seat is original and it remains in excellent conditionand#44; and theres a newer AM/FM/CD stereo in the original slot near the driver. 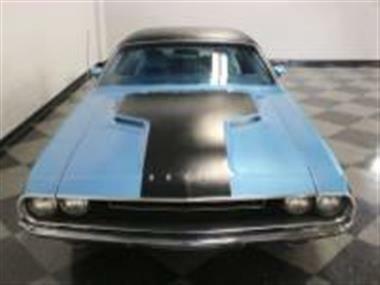 Finallyand#44; the trunk is neatly finished with a correct mat and a full-sized spare with jack.<br /> <br /> Originally a 383 2-barrel carand#44; this awesome Challenger now sports a built 383 thats been tweaked to make a bit more horsepower. With a mild cam inside to give it a slightly lopey idleand#44; a big 4-barrel carburetorand#44; aluminum intake manifoldand#44; and proper set of long-tube headersand#44; it cackles like a true muscle car should. 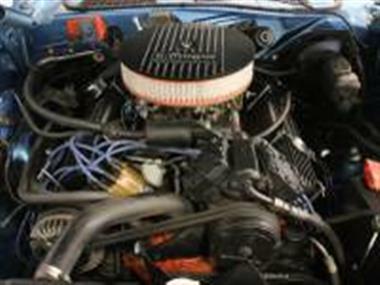 Aside from the finned air cleaner and valve covers that add a high-performance lookand#44; it looks fairly authentic under the hood. Its backed by a rebuilt 727 TorqueFlite 3-speed automatic and 8.75-inch rear end with easy-cruising gears insideand#44; which we suspect are 3.23s. The Flowmaster exhaust system is brand newand#44; there are fresh shocks all aroundand#44; and while its not restored for showand#44; the underside is quite clean and solid. Factory Magnum 500 wheels with staggered 215/70/14 front and 235/60/14 rear BFGoodrich radials complete the look.<br /> <br /> When we dream of our ideal carand#44; its always a shock to find that it actually exists. This Challenger is one of those rare finds that hits all the right notes. Call today!